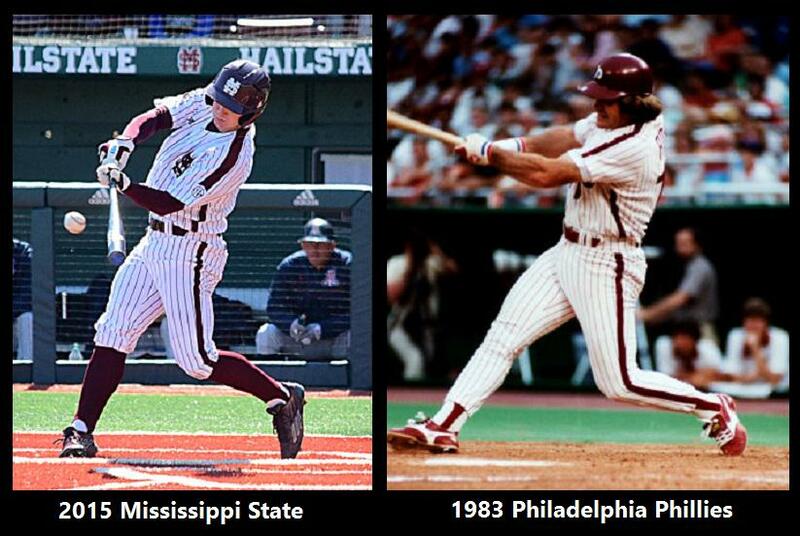 The Bulldogs started off the third weekend of play wearing the Maroon MS jersey for the third Friday in a row. On Saturday, the Bulldogs busted out combo #6 of 17- the Pinstripe uniform- but with an unfortunate twist. Reminiscent of the Philadelphia Phillies in the 80's, the uniform has a stripe running down the pants, side of the jersey, and the top of the shoulder (which ends in a ribbon shape, similar to the football uniforms worn from 2012-2014). The general response from the fan base is that Adidas is over-designing, which I agree with. The pinstripes are not as sharp as the were in 2013 and 2014, but they are still a nice look. In what seems to be becoming the usual, the Bulldogs rolled out the Creams unis on Sunday, with the Maroon hat this weekend.